This year, I found an eclectic assortment of gifts for guys of all tastes. Whether in the realm of practical or fantastical, here is some inspiration devoted to the Y chromosome crowd. 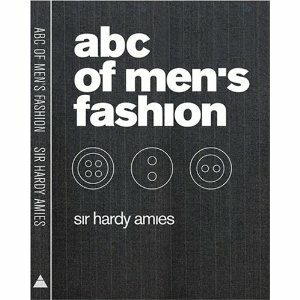 Hardy Amies is responsible for my favorite quote regarding men’s fashion: “A man should look as if he has bought his clothes with intelligence, put them on with care, and then forgotten all about them.” This sartorial primer doles out classic advice for the traditionally dressed man in your life. A small gem, this book, reissued a few years ago from its original ’60s printing, is witty and wise, just like its author was. 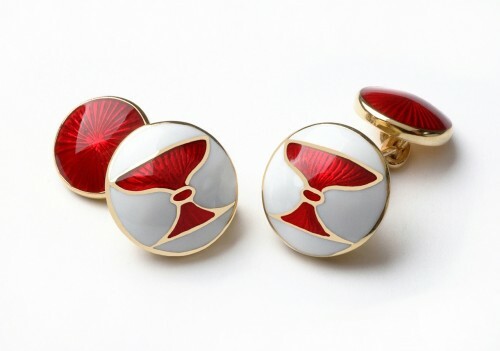 For a little sartorial splendor, these Annelli Wine Dealers cufflinks would do any debonair dresser proud. Based on the ancient Florentine guilds, these are hand made in Italy of enamel and 18k gold, although also available in sterling. This pair represents the Wine Guild which counted Giovanni di Piero Antinori, of the now famous Tuscan Antinori wine family, as a member in 1385. They would appeal to any history buff interested in adding a distinctive and elegant touch to his attire. Hardy Amies would have approved of this dapper selection. 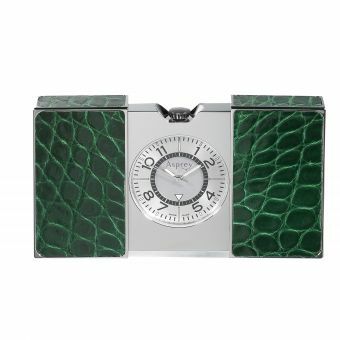 The green alligator Clic Clac Travel Clock from Asprey would be a handsome addition to any gentleman’s hotel room or bedside table. Very Nick Charles don’t you think? 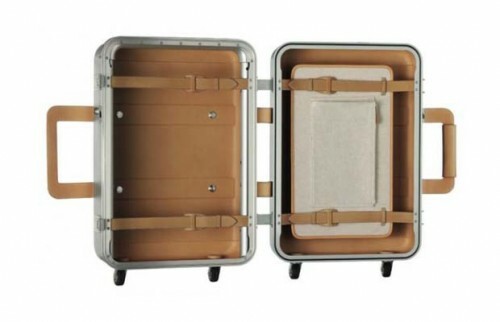 And for our Mad Man on the go, the Hermes Orion luggage has timeless appeal. 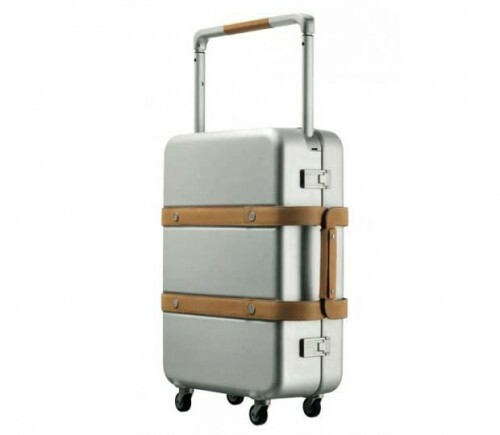 Designed by Gabriele Pezzini, Hermes Design Director, it features a brushed anodised aluminium shell reinforced with carbon and Kevlar. The aluminum gives it a modern edge toned down with the beautiful leather detailing giving it that classic Hermes je ne sais quoi. 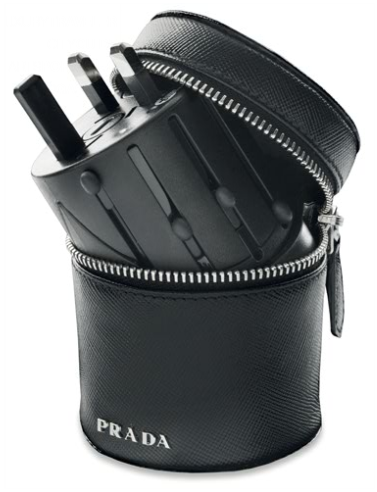 To keep him connected while he’s away, Prada makes a handy multiple outlet plug travel case. And for our gentleman’s office, I love this Junghans table clock from the Cooper-Hewitt shop. 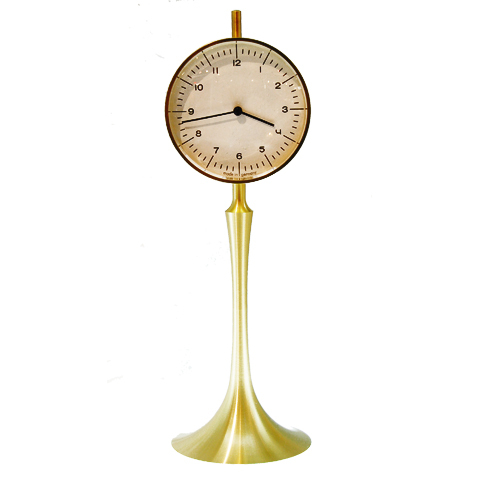 The brass and crystal clock is actually a reproduction of a prototype from 1960 found in the legendary company’s archives. 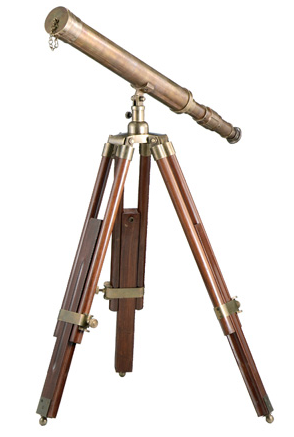 And for when he’s working late, he can take a star-gazing break with this Antique Reproduction Telescope with adjustable tripod from the Well Appointed House. Not to mention it will give his office that Indiana Jones professorial appeal. 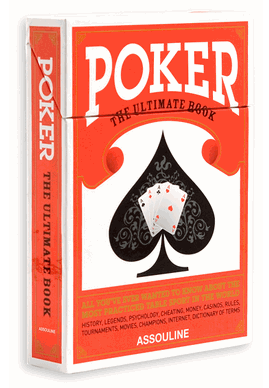 Wouldn’t these look handsome in his bookcase or on his desk? The perfect combination of superior technology and luxury, the super luxe German Ultrasone Edition 10 limited open-back audiophile headphones are made with Zebrano wood ear cup inlays, Ethiopian sheepskin leather ear cup pads, Titanium plated drivers and Kevlar coated cables. 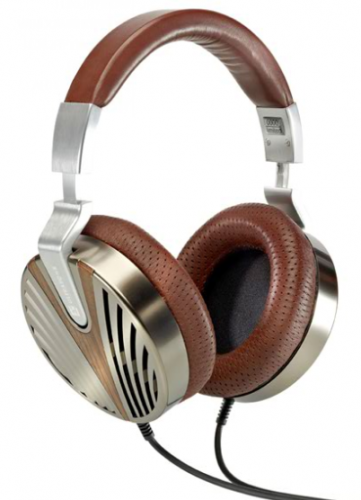 These are the most luxurious headphones the Bavarian company has ever created. 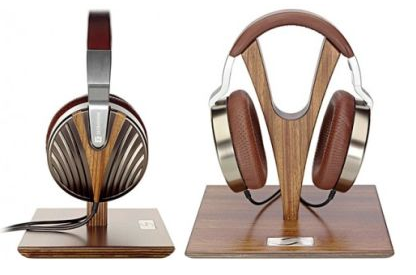 Inspired by the wings of a butterfly, “each Edition 10 headphone comes with a hand crafted Zebrano wood headphone stand and is housed in its own wooden box for safe storage and transportation. Only 2010 Edition 10 headphones will be produced, each one will be embossed with its own serial number.” A special gift for the man who has everything! 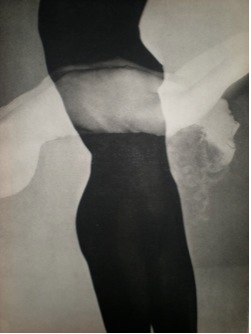 The art collector in your life would be ecstatic to receive Facile, an original limited edition book published in Paris in 1935 with 12 full-page photographs by Man Ray that accompany poems by the French writer Paul Eluard. The photographs are of Eluard’s wife Nusch. This small folio, from Elizabeth Phillips Rare Books, is one of only 1,200 numbered copies. Facile is “one of the iconic French photobooks of the 1930s… a landmark modernist book and an inspiration to generations of graphic designers” (quote from The Photobook by Martin Parr). 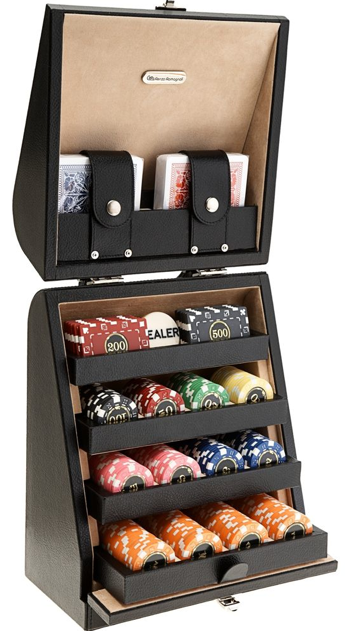 For the man who is playing high stakes games, this Renzo Romagnoli’s Black Dollar Texas Poker Game Set will let him ante up in style. Think Daniel Craig in Casino Royale. 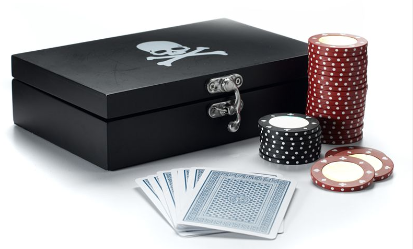 If your guy’s high stakes game involves pizza and beer rather than black tie and champagne, then perhaps this set on super sale from Macy’s is more his speed. Chaneling Matthew McConaughey in How to Lose a Guy in 10 Days for this one. 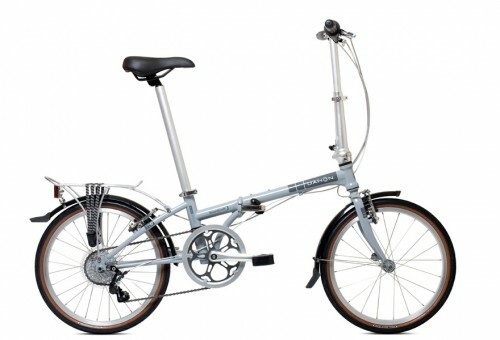 For the urban dweller who longs to ride on something other than the subway, folding up this Dahon Boardwalk D7 in his trunk to go for a ride in the country is a breeze. It collapses in less than 15 seconds, fits almost anyone and at 27 pounds is a cinch to get in and out of the boot of your car. 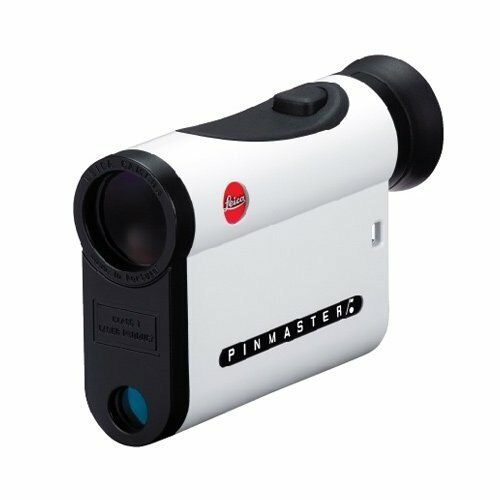 If he prefers spending time on the links, the Leica Pinmaster would be a great addition to his golf bag. Whether a scratch or novice golfer, this waterproof golf laser rangefinder is sure to become his favorite companion on the green – unless you play with him of course. With Leica’s famous dependable precision, an ergonomic fit and a convenient size small enough to fit even in a slim shirt pocket, this is a nifty little gift. Heading to the slopes? 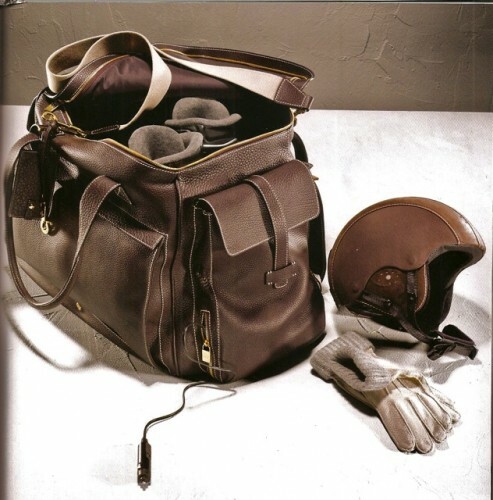 Do you think he’d be thrilled to carry his ski boots in Loro Piana’s luxurious “My Ski Boots Bag?” It’s made of naturally water-repellent Norwegian Fjord leather and lined with their fabulous waterproof Storm System microfiber. Or do you think you’d be borrowing it so much that it wouldn’t really be much of a gift for him! 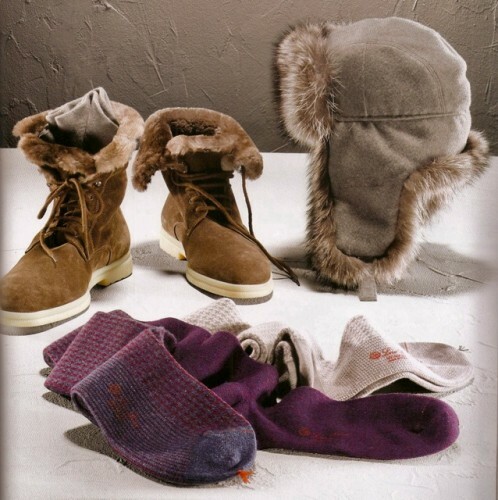 If that’s the case, you could always get him these little Loro Piana luxuries instead. They’re guaranteed to keep him toasty warm. Is he more the rugged outdoorsy type? 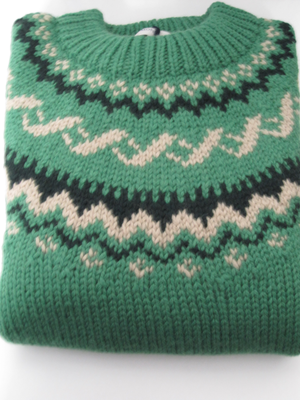 He can still be stylish on the slopes in this Moncler Ski Sweater from Peter Elliot on Taigan. No matter what you choose, the man in your life undoubtedly knows that the real present is spending time together during the holiday season. Have a merry! This entry posted in art, books, games, gifts, golf, holiday, photography, sports. Entry Tags: Facile, Hermes Luggage, Janus Films Essential Art House, Junghans Table Clock, Leica Pinmaster, Prada Plug Travel Case, Ultrasone Headphones Bookmark the permalink. How do you find the time? I can’t beleive all the cool things you’ve found when I can barely find an electric razor for my man. Hi Holly – I don’t sleep a lot!! Glad you enjoyed my finds! So many great ideas…adore the Hermes luggage…so handsome!! MDC – Love the Hermes luggage as well – they have an adorable video for it on YouTube if you want to take a peek. Hi Kate – Thanks!! Glad you liked them! Oh, my! Your posts are getting better and better! You put so much effort into it and it shows! I’m even a bigger fan of your blog because of that! Good Job. I like mostly of the things you’ve chosen, but I think the green alligator clock is outstanding! How charming is that? That’s a gift for life. Hi Luciane – Thank you – you’re too kind. Isn’t the Asprey clock incredibly chic?! I’d love it for myself! Hi Kayce – Thanks! It was fun! I wouldn’t mind having a few of those gifts myself! Beautiful choices. Hi Teresa – Me too – I would take any of these!! Hi Stacey – Thanks! So glad I could help – hope he enjoys!! You’ve come up with some fabulous and unique options that aren’t the same old, same old. Love your options. Hamptontoes – Thank you so much – I do try! What a handsome group of luxe items…I’d like some of these myself too! :) Those are the coolest headphones, ever! 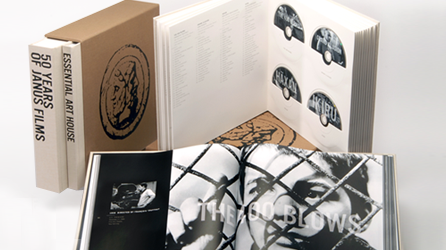 And that DVD Janus collection is such an amazing gift. Beautiful roundup. Hi Jennifer – Thanks! I think I would like most of these myself as well! Great minds :) Very cool choices! Hi Connie – Ain’t it the truth – thanks! Men-shmen. I’d take any of those as a stocking stuffer—particularly that roll-around Hermes case! Duchy – Fabulous no? I’d take any of them as well! You are just so good at this…I think I will give him the Hermes Luggage and those gorgeous ear phones…and then borrow them back from him! Hi Jermaine – Well thank you! Now there’s a good idea – way to have your cake and eat it too! 82 queries in 1.109 seconds.